There are at least six artists with this name: 1. A popular hard rock band from the United Kingdom 2. A death metal band from Germany 3. An alternative rock band from Poland 4. A Eurodance group 5. A thrash metal band from the Czech Republic 1. The Darkness are a hard rock band which formed in Lowestoft, England in 2000. The band consists of Justin Hawkins (vocals, guitar, keyboards), Dan Hawkins (guitar, vocals), Frankie Poullain (bass) and Ed Graham (drums). 1. The Darkness are a hard rock band which formed in Lowestoft, England in 2000. The band consists of Justin Hawkins (vocals, guitar, keyboards), Dan Hawkins (guitar, vocals), Frankie Poullain (bass) and Ed Graham (drums). According to the Nothin's Gonna Stop Us Songfacts, Ed Graham inspired the band's name as his youthful bleak moods were known as The Darkness. They are widely regarded as a glam rock band, but the members disputed this and saw themselves as a classic hard-rock band. Their highly retro style of music was influenced by rock bands like Queen, AC/DC, Guns N' Roses, Aerosmith, Sparks, Led Zeppelin, Van Halen, T. Rex, Def Leppard, Whitesnake and Thin Lizzy. They are best known for the soaring falsetto of their lead singer Justin Hawkins, whose departure in 2006 resulted in the dissolution of the band. In 2011, the band announced their return, with a third album, "Hot Cakes," to be released on Wind-up Records. Dan had initially seen his brother's potential of being a frontman after Justin did an impressive recreation of Queen's 'Bohemian Rhapsody' at a New Year's Eve party in 1999, thrown by Justin and Dan's aunt in her pub The Swan at Gillingham just over the River Waveney in Norfolk, despite the fact that Justin was only miming to the original song. Playing at first only in pubs and bars, their pyrotechnic guitar solos and over the top performances soon brought them to public knowledge. Achieving major success in the UK in 2003, The Darkness received considerable radio airplay of their singles, including I Believe in a Thing Called Love and the Christmas hit Christmas Time (Don't Let The Bells End). Their debut album, Permission to Land, reached number one in the UK charts and went on to sell one and a half million copies in the UK alone. The success of this album led to heavy touring for the band, which included headlining the Carling Festivals in 2004. The band won three Brit Awards in the same year, including Best Group, Best Rock Group and Best Album. They also won two Kerrang! awards for Best Live Act and Best British Band. By late 2004 the band's huge success had led to a public backlash, and people claiming that the band were more a joke than a 'real' band became more common. The band responded to this criticism by touring the UK's top arenas on the "Winter-National Tour" tour with the Irish group Ash supporting them. One part of the show included Justin climbing upon a life-sized white tiger during "Love on the Rocks with No Ice" and being elevated around the audience whilst still playing guitar. The majority of the shows on the tour sold out. On May 23, 2005 original bass player Frankie Poullain left the band during the recording of their second album, apparently due to "musical differences" with Justin Hawkins. Frankie has disputed this version of events, claiming he was "frozen out" and forced to leave the band by Justin and his longterm girlfriend (and the band's manager) Sue Whitehouse. On June 13 2005, The Darkness announced that Richie Edwards, formerly Dan's guitar technician, had replaced Frankie as bass player. One Way Ticket, the first single from their second album, was released on 14 November 2005, debuting and peaking at number 8 on the UK Singles chart. The Darkness followed this with their second album One Way Ticket To Hell...And Back on November 28, 2005 to mixed reviews despite it having been produced by the well known Roy Thomas Baker whom has worked with bands such as Queen. Although it has been made platinum its sales do not come close to their debut's five-times-platinum rating and its chart peak at number eleven is a weak showing compared to Permission To Land's number one. The second single release from this album was Is It Just Me?, released on 20th February 2006 and charted at number eight. Soon afterwards Justin announced while performing live that the third single to be released from the album would be Girlfriend; and gained a mixed response. Released on 22nd May 2006, it charted at a disappointing number thirty-nine. After having disappeared for quite some time the band announced that singer Justin Hawkins had left the band on 11th October 2006, after a battle against drugs. On December 24, 2006, it was reported by Yahoo! News that bass player Richie Edwards would become the group's new frontman, with Toby MacFarlaine to join The Darkness and take over on bass. In blog entries on MySpace, Richie Edwards, Dan Hawkins and Ed Graham said that they had started recording a new album with Toby McFarlaine, and that they had formed a new band together. On March 2, 2007, The Darkness' official website was changed, showing a photograph of the new, and as yet unnamed band. Links to the members individual Myspace pages were included, confirming the line-up of Richie Edwards, Dan Hawkins, Toby MacFarlaine and Ed Graham. Richie later added a message to the site, categorically confirming that the band would not continue under the name "The Darkness", saying "we are literally days away from announcing our new name". It was announced on August 25, 2007 that the band had finished recording an album but no release dates or names, of either the band or album, had been decided. Record label and support has yet to be decided. On November 9, 2007, it was announced on The University of East Anglia's student union website that the new band would be called Stone Gods. This name was confirmed on the official website on November 21, 2007. The line-up has been confirmed as Dan Hawkins (lead guitar), Toby MacFarlaine (bass), Ed Graham (drums) and Richie Edwards (vocals/guitar). 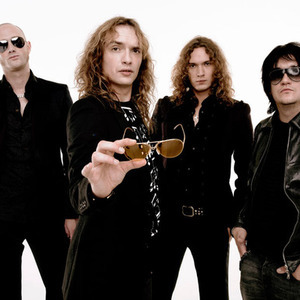 In March 2011, The Darkness announced on their newly updated website that they would be reforming the original line-up to play the Download Festival in Donington, Derbyshire. Songfacts reports that Nothin's Gonna Stop Us, the first new material from the band since they reconvened, was made available several months later as a free download from The Darkness's official website. The Darkness will be releasing "Hotcakes," their first album since reuniting, in 2012 on Wind-up Records. This album includes the singles "Every Inch of You" and Everybody Have a Good Time."